The Ministry of Environment, Forest and Climate Change (MoEFCC) has launched a two week-long Clean Air Campaign in Delhi. The Campaign started on 10 February 2018 and is presently ongoing. 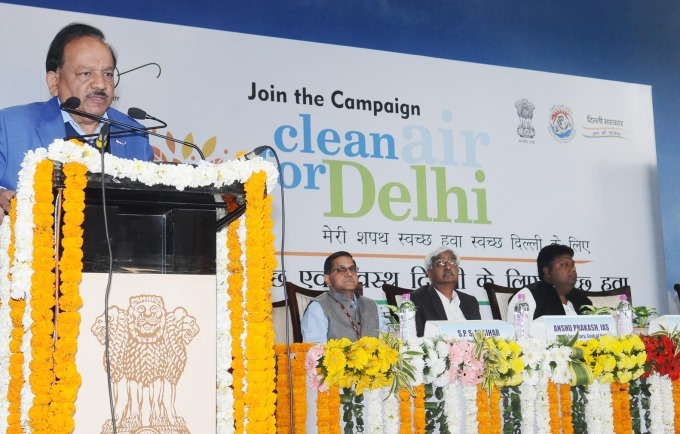 Environment Minister Dr. Harsh Vardhan has already clarified that this Clean Air Campaign is not just a symbolic exercise, but a serious effort to drastically bring down pollution levels in the National Capital. Dr. Harsh Vardhan also stated that air pollution is a serious economic and health issue and that the campaign will not be restricted to these two weeks only, but taken throughout the year on a continuous basis. The air in Delhi has been heavily polluted since the past few weeks now. Episodic high pollution event (Severe+) in Delhi NCR commenced on Nov 07, 2017 and ended on Nov 13, 2017. Air quality in Delhi becomes worse during winters due to prevailing meteorological conditions of lower mixing height, higher humidity, fall of ambient air temperature coupled with lower temperature difference between maximum and minimum, calm to low wind speed, etc. According to a Report by the Ministry of Earth Sciences titled, “Scientific Assessment of Delhi’s Winter Air Quality Crisis” the role of Gulf dust storm on peak pollution day of November 08, 2017 was 40%, and it was around 25% from stubble burning. These are therefore key external factors in the episodic rise of air pollution as per Government sources. It is for this reason that the MoEFCC and the Government of Delhi have joined hands to launch this intense exercise to address all sources of pollution in Delhi from February 10-23, 2018. Seventy joint teams of officials of MoEFCC, Central Pollution Control Board (CPCB), Delhi Government, Delhi Pollution Control Committee, Municipal Corporations and New Delhi Municipal Council (NDMC) have already been constituted. These teams are visiting every administrative division of Delhi, monitoring the causes of pollution and initiating remedial measures, including penal actions against serious polluters on the spot. However, only 300 Challans have already been Issued out of more than 800 cases of violations till 13th February, 2018 which seems pretty less for a city with a 20+ million population. The Central Government has also recently notified dust mitigation norms to contain dust pollution, which is considered to be one among the major causes of air pollution in Delhi. The Environment Minister Dr. Harsh Vardhan also inaugurated a Workshop on Environmental Health, as part of this Clean Air Campaign. The Workshop called for increasing the number of PM2.5 monitoring stations and that recommended for the inclusion of Environmental Health subject in Medical curriculum for all medical colleges. Another Workshop on Technological Innovation for Mitigation of Pollution has also been organised as part of this campaign. A control room has been set up in CPCB to monitor the daily progress of the Clean Air Campaign, which will be shared with both the Union and State governments. The objective of this control room is also to suggest any midway corrections, if required. Clean Air Campaign by CPCB/DPCC is timely. What are its goals? was done by IIT Kanpur who gave an action plan from 2016 – 2023. How much of the plan has been implemented? By which agency/nodal agency? How effective has it been so far? Air Quality Resource Group at CESE IIT Mumbai and Kanpur. Centre for Excellence in Urban Design and Development at IIT Roorkee should formulate a ‘Urban/Regional Policy’ for air,land and water pollution control and mitigation.